Michelle made some delicious baked spring rolls and I provided ingredients for everyone to make their own fresh rolls, so I decided to do them in one post, along with Karen’s yummy dipping sauces. Up first, the fresh rolls, since basically you can put whatever you want out and let everyone make their own! 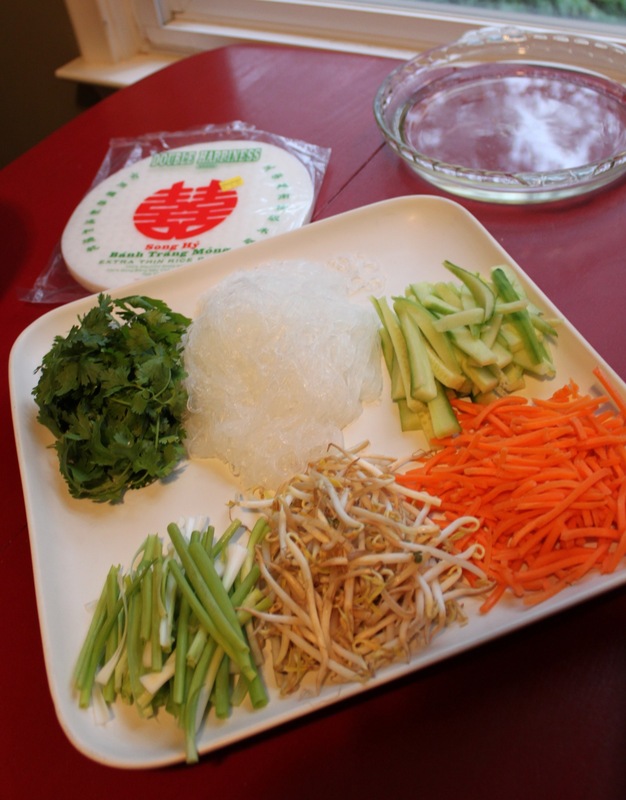 You need to buy some rice paper sheets, which people dunk into a plate of water until soft, then they can fill with whatever veggies and herbs you have on hand and roll them up. I always make big fat ones with too much filling for myself. If you were to make them to serve to others in a more elegant way, you could make them thinner and cut them into slices. I put out sliced green onions, glass noodles (other Asian noodles work great too), mung bean sprouts, carrots, cilantro and sliced cucumbers. Tofu also would be good here, especially if you’re making thinner ones because it could stick together better when sliced. And now, onto Michelle’s spring rolls! These were GOOOOOD. And baked no less! I try not to order stuff like this out too often because, let’s face it, fried crap is bad for you. But these are baked and homemade and oh, so good. Michelle said she got these from her friend and adapted them to include veggies she had on hand. I imagine you can get pretty creative with these and include whatever you like! 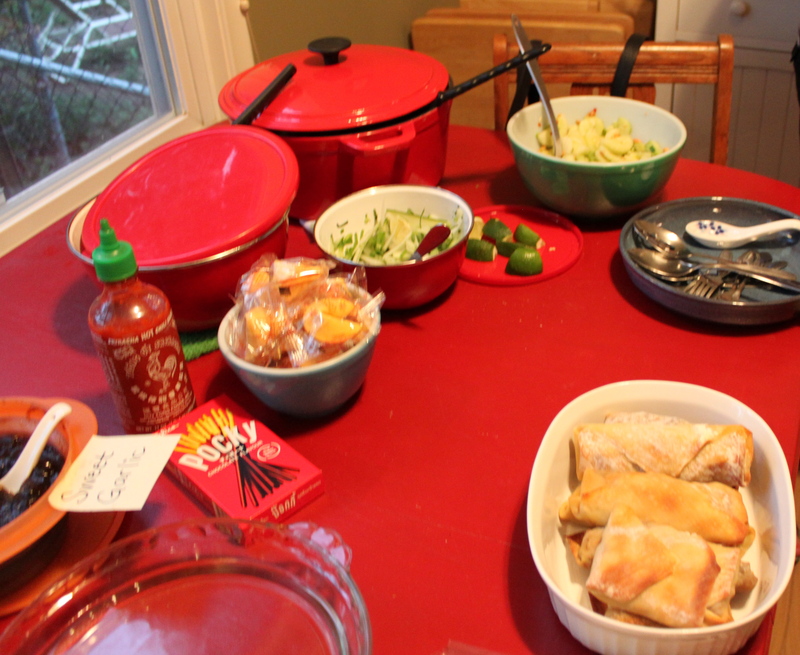 (The spring rolls are in the bottom right corner in the white dish). 1. Cut up all veggies into small pieces (thinly sliced). In large pan or wok heat up canola oil and add mushrooms and ginger. After a minute, add rest of veggies. Cook for 2-3 min. Add sesame oil, soy sauce, vegan sugar, salt and pepper. Cook another 3 minutes. Remove from heat. 2. Take an eggroll wrapper, use fingers to moisten the edge with water, lay the wrapper in a diamond shape and place veg mixture in middle. Fold up bottom, sides and then roll up to the top (use enough water to seal). 3. Bake at 400 for 10-15 minutes (until nicely browned I imagine) or I’m sure you could also steam or fry. And now for Karen’s delicious dipping sauces! 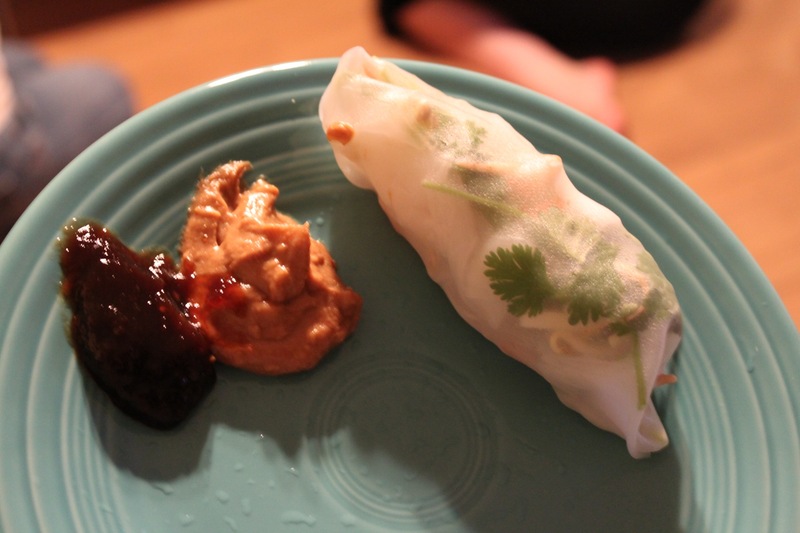 Unfortunately I didn’t take pictures of all three sauces, but I did take a photo of my own fresh roll and the two sauces I used with it — the peanut sauce and garlic sauce. 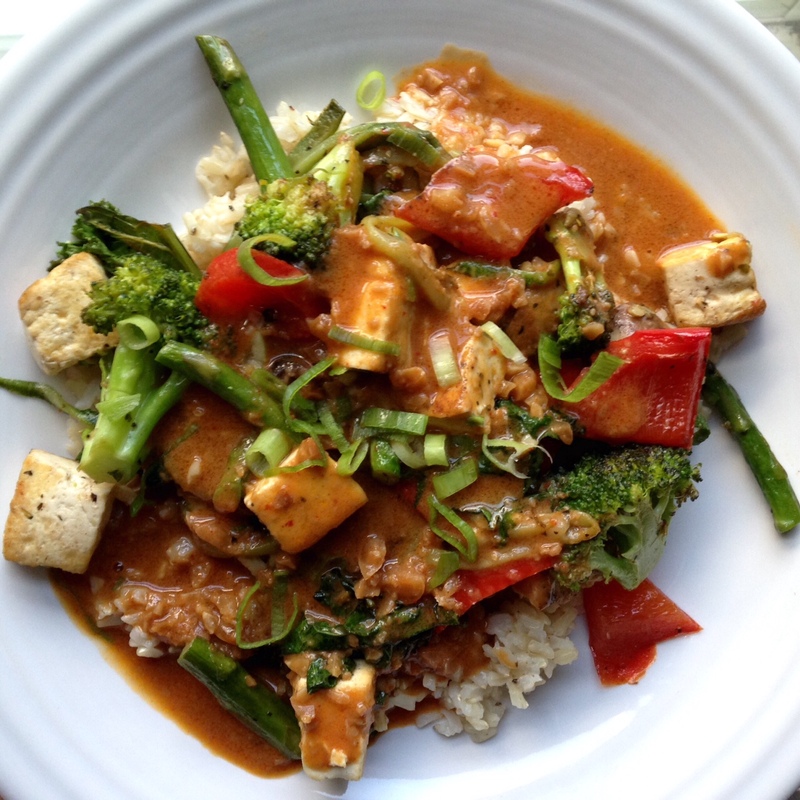 Here are her recipes for those two and the ginger lime! stirring at a simmer until thick. Stir in garlic/salt. serve warm or cool. Mix everything together! Mix everything together!